is an enormous pile of unwashed laundry. 1. "Wat you doing, Daddy?" "I'm vaccuuming." "Oh. You clean up my mess? You clean up my Cheerios?" Let's just say a garlic press and a handful of Cheerios make quite the uh, mess. While Jordan vaccuumed, I wiped down the bathroom. When he finished, he popped his head in the door and said: "You're cleaning the bathroom? Honey, don't take my vaccuuming as an impetus to clean the whole house. I might never do it again." 2. 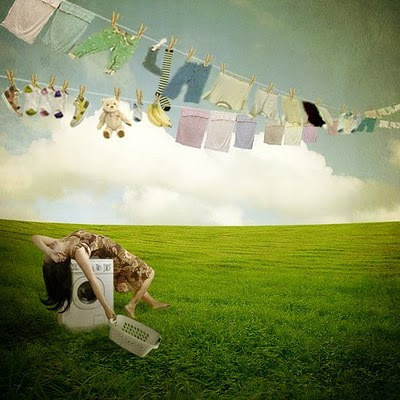 I find it disturbing that of the all the (often neglected) household chores - laundry and dishes and their done-ness or piling-up-ness are the two that depress or exhilirate the most. See, if the dishes are done and the counters are clean, I'm superwoman. If Reagan has clean underwear (despite mulitple changings in the course of a single day), I'm the cat's meow. BUT - if the dishes pile up on the counter or Reagan's been wearing the same pants (and a pull-up - or diaper!) for 3 days, I'm a terrible wife, mother, housekeeper. (sigh) It's a terrible cycle. Laundry is the one I put off. I would way rather do dishes, vacuum or any other kind of work than do laundry. Especially ironing. Oddly enough, I love to do laundry (yes, even though I put it off). I love the methodical neatness of creating order out of chaos and laundry is the perfect (and perfectly manageable) example - a mishmash pile of dirty clothes, in the washer, hung on the line, folded and put away. If only I could make myself do it more often. But yes, ironing's the devil.